© Horizontal Top Bar bee hives are an interesting, alternative method of keeping honey bees with no frames or wax foundation. This enables the bees to free range in the bee hive creating their own natural nest and honeycomb - it is like seeing a wild nest in a hollow tree. We have kept bees in top bar bee hives for many years so the Cornish Top Bar bee hive is our own design, developed to suit beekeeping at U.K. latitudes with regards to both the bees and the beekeeper as well as current (and increasingly important) pest management practices. Beginners should note that some beekeeping knowledge is required no matter what bee hive you choose so a top bar bee hive is no exception. Beekeepers who have not used a top bar bee hive before should note that the same beekeeping knowledge and techniques that are used with conventional National bee hives can be applied to a top bar bee hive. Managing and inspecting a honey bee colony in a Cornish Top Bar hive can be simpler and less work than in a vertical hive as there is little or no lifting required. However, this is a primitive and low tech method of keeping bees which some find less easy to use but we have detailed here the techniques and tips that we have found useful in our experience (assuming a working knowledge of keeping bees in a National bee hive for example). When the roof is removed from the top bar hive there is no crown board. There are no gaps so no bees and no heat escape from the hive and at this point the colony has not yet been disturbed. Thin spacers are used to fill any small gap there may be at the back. The dummy board at the back of the hive does not have to be removed but is just levered and slid backwards to reveal the combs. The dummy board can also be used to enable the colony to be temporarily split within the same hive during the artificial swarm process to control swarming and queen replacement. The entrances at the back of the hive are used for this purpose but should otherwise be kept blocked. As in nature, a colony should be started at the front of the hive enabling all the wax building bees to work together to expand backwards, not in the middle of the hive or this workforce will be split. Bees will also naturally want to store their precious honey away from the entrance. Our entrances are in a warm way configuration suited to our latitude. This means the first comb at the front acts as a baffle against incoming draughts. When a colony is expanding and needs more space, the dummy board is simply moved backwards to provide space for more top bars. A feeder can be placed on a shelf behind the dummy board when required. Before levering any top bars apart you must ensure that the edges of the comb are not stuck where they meet the hives walls. We have designed the sloping sides in sympathy with the natural catenary shape of the comb to discourage this but sometimes the combs are joined to the walls with small braces or bridges of comb. Use a little smoke to clear these areas so you do not injure bees when you use the blade of the hive tool to cut these connections. You can then lever the top bar away from its neighbour and lift it to inspect the comb. Remember to always keep the plane of the comb vertical to prevent breakage. Although you can lightly shake a top bar comb in the vertical plane to remove flying bees it is recommended to use a bee brush to avoid the risk of the comb breaking off the top bar. Although the bees can be encouraged by wax starter strips or comb guides on the top bars to build straight combs they can sometimes go off the straight and narrow. Any slight deviations are rarely a hindrance to the beekeeper but if the colony is left unchecked adjacent combs subsequently built will follow the same deviation often magnifying it and making it worse. It can become a real problem with resultant cross combing when combs are joined to more than one top bar. This can be avoided by inserting new top bars between existing combs that have already been built straight which will act as formers ensuring the new comb will also be built straight. The only solution for cross combing is to cut out the offending portions of comb. These can be placed at the rear of the hive away from the cluster so they will not be reused but the bees will be able to clean out and use any stores in the comb after which it can be removed. The same procedure can be used if a comb accidentally breaks off from the top bar. When replacing a top bar next to another, first use a little smoke to clear the sides of the bars where they will meet, before sliding them together, so bees are not crushed in between them. 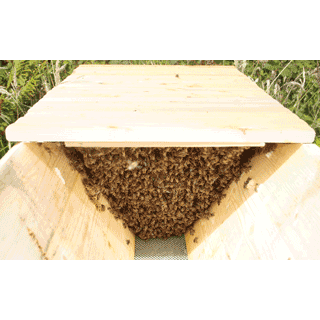 Our top bars are designed to maintain a bee space between the edges of the comb and the hive walls. In the horizontal hive the broodnest is kept at the front so when the inspection has finished all the bars are slid back to where they started although any additional top bars could be inserted before this is done. Harvesting and extracting honey from top bar combs is a basic and simple process. Carefully break or cut honey combs from the top bars, a neat job is not necessary. Put the top bars straight back in the hive for the bees to clean up, rebuild and refill. The honey combs are put into a honey bucket and crushed and mashed to break down the wax cell walls and release the honey. Gently warming the bucket of crushed comb in a Honey Warmer will make the honey flow easily and efficiently so it can be strained to remove the wax.